Feature showers are at the forefront of modern bathroom design, providing an architectural focal point for a luxury showering space that is a joy to use. There’s no need to tuck your shower away in the corner of your bathroom, especially if you are spending time and money to create a luxury bathing space or spa bathroom. Feature showers work well in open-plan bathrooms, or can stand alone in a shower room or wet room. You can choose to highlight your feature shower with tiling, integrated storage and shelving, panels, lighting, flooring and a range of beautiful shower fixtures. By placing your shower in a bold or central position in your bathroom you will allow for easy access and a spacious showering area. With a feature shower you are not constrained to a small, awkward corner enclosure – stretch out and enjoy the space of a single panel shower area, or a circular, C-shape or S-shape shower! 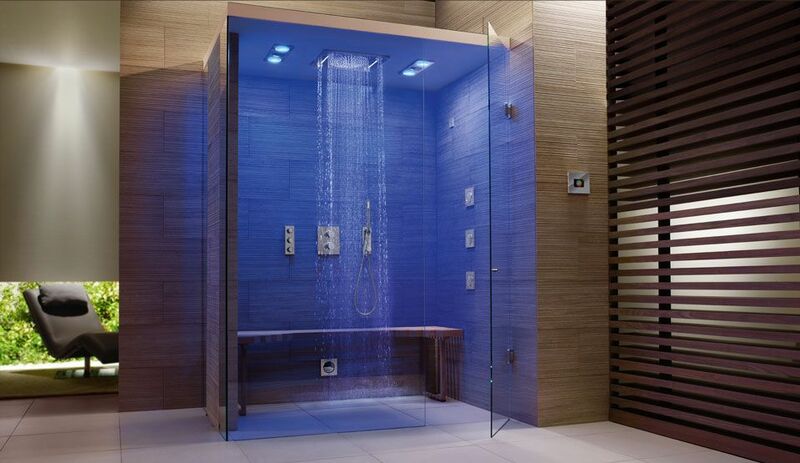 One of the most exciting aspects of a feature shower is the opportunity to truly spoil yourself with an exhilarating showering experience, from spa jets to a ‘monsoon’ shower, built-in seating to bespoke lighting. Switch from hot to cold with clever thermostatically controlled water to find your perfect temperature, and add mood lighting to bring an atmosphere of relaxation to your shower. Some feature showers even provide rejuvenating massage therapy with 360-degree water jets to ease tired muscles at the end of the day or start your morning with a blast of energy. The options for feature showers are endless – find the right solution for your perfect shower by combining the practical with the aesthetic. For help planning your feature shower, spa bathroom, or wet room, Concept Virtual Design has everything you need. This entry was posted in Luxury Bathrooms, Luxury Interior Design, Luxury Steam Rooms, Luxury Wet Rooms and tagged C shaped shower, circular shower, feature showers, luxury bathroom design, luxury shower, luxury wetroom design, massage jet shower, monsoon shower, open plan shower, S shaped shower, spa bathroom, spa jet shower, wet room showers, wetroom shower. Bookmark the permalink.